Today’s post is a Masters of the Universe fan character created by He-Man.org forum member Patreek. You can read all about Wraptor here (initial creation), here (development and design), and here (posting of final pictures). Four artists were asked to draw up the “final” illustrations of Wraptor, (click on their names to see their versions): Bearshow, Buffalo Bill Man, Super-Munkyboy, and me. My version of Wraptor is definitely meant to be in the style of the classic cartoon, while the others are done in the style of the 2002 revamp. I had seen Bearshow’s design already, and Patreek had given me a sneak peek of Buffalo Bill Man’s work-in-progress for reference. Their designs and final renderings were fantastic and done firmly in the style of the recent version of He-Man. Putting Wraptor into “classic” mode really just meant simplifying some costume elements and leaving out the skeletal snake appendages. The colors are heavily influenced by Bearshow’s version, though I simplified and brightened the colors somewhat, to give Wraptor the cartoony feel of the old series. I added the horny ridges on his brow just because I thought it made him look more dinosaur-y, and simplified the whip so that it wouldn’t distract from the snake-bandage-tendril-thingees. 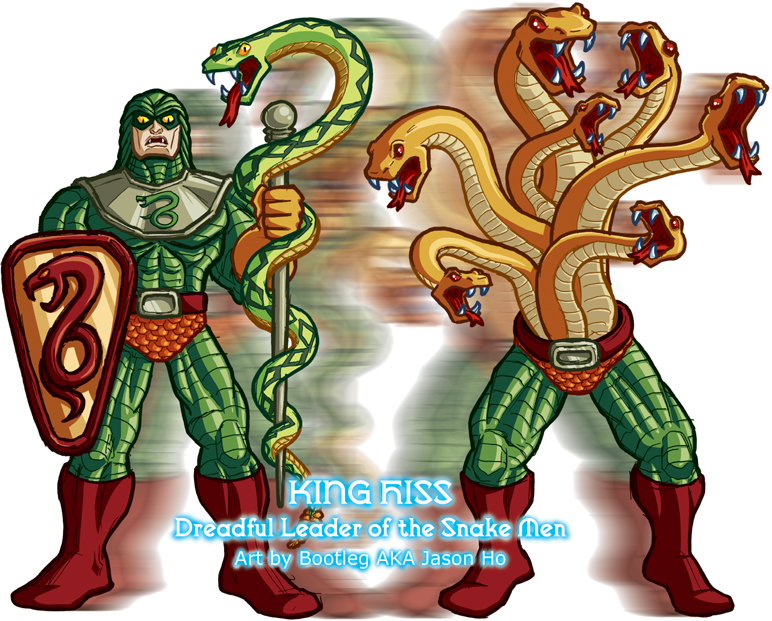 The snake-bandages, by the way, are something taken directly from Patreek’s earliest version of the character, and are my favorite thing about the character, along with his perfectly punny name. 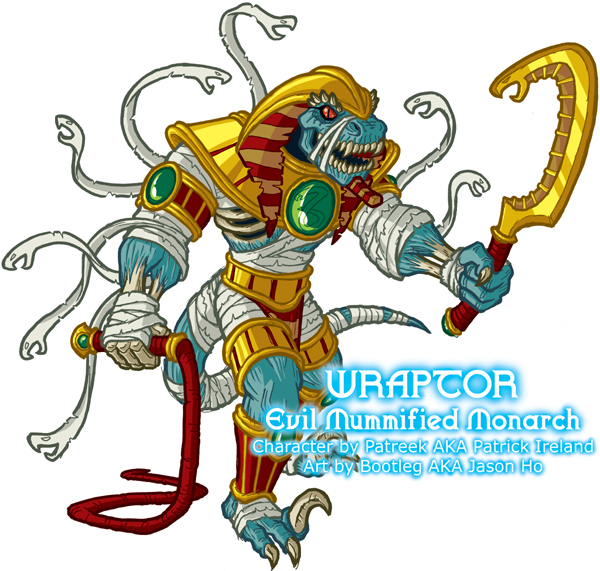 Please check out the awesome renditions of Wraptor by the other artists, and definitely read Wraptor’s bio! And thanks to Patreek for inviting me to join in on this! Fun Fact: Wraptor’s blade is a khopesh!